Despite the cheerful sounding name–which I find reminiscent of familie names like the Waltons, the Cleavers and even the Andersons from “Father Knows Best”–the Parabens are certainly not the Brady Bunch of cosmetic chemicals that their name suggests. Parabens belong to a family of synthetically produced chemicals known as parahydroxybenzoates. Parabens are used as antimicrobials or preservatives by the cosmetics and the pharmaceutical industries, the most widely used parabens being: methyl-, ethyl-, propyl-, and butylparaben. 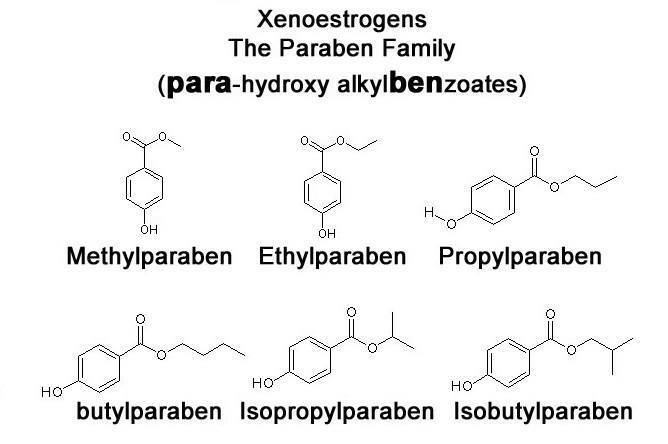 A wide range of parabens–including all of those mentioned above–have been found to possess varying degrees of weak estrogenicity and therefore the possibility of subsequent effects have caused significant concern within the scientific community. Estrogenicity, when used in reference to synthetic chemicals refers to the ability of those chemicals to mimic and behave like human estrogen hormones within the body. The effects of parabens in this respect are a cause for concern as in mammalian studies, butylparaben, the most potent endocrine disruptor of the bunch, has been found to possess the ability to cause a phenomenon known as competitive binding. Competitive Binding is the ability of a synthetic chemical, once it has entered the body, to occupy specific receptor sites intended for the body’s own natural chemicals–in this case estrogen hormones. Once a synthetic chemical has occupied the site it prevents the hormone intended for the target receptor, from binding at the target site. Competitive binding becomes problematic and potentially toxic when and the effects of the synthetic chemical on the intracellular signaling pathways differ from the natural hormone intended for binding with the target receptor. 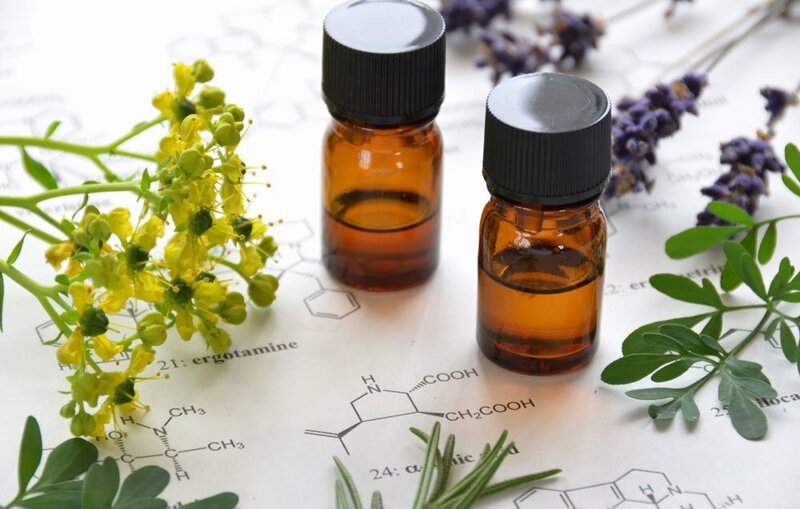 amending Annexes II and V to Regulation (EC) No 1223/2009 of the European Parliament and of the Council on Cosmetic Products, extreme and stringent limits were set on the use of parabens to either 0.4% or 0.8% dependant upon the molecular form. In a unilateral move Demark outright banned propylparaben and butylparaben, in all forms for use by children under three years of age based on the risks of endocrine disruption. While regulators have deemed extremely low concentrations of parabens in cosmetic products to be “safe,” breast cancer research challenges their hypothesis by demonstrating that parabens are able to accumulate within the body, meaning, that even if effects are “weak” and even when used in small concentrations bioaccumulation within the human body can occur, that is to say, the more one uses it, the more of it is collected and stored in human tissues. Detailed studies have enabled the identiﬁcation and measurement of high concentrations of different types of parabens in twenty samples taken from human breast tumors analyzed using high-pressure liquid chromatography followed by tandem mass spectrometry. Comparison of individual parabens showed that while methylparaben has not been identified as being of the most potent parabens in competitive binding it was found to be present at the highest level within tissue samples, representing 62% of the total paraben content identified in tumor samples taken from breast cancer patients[13,16]. Further information concerning the safety of parabens has yet to emerge as in-depth studies on the topic are lacking. Despite the protestation of many concerned doctors and scientists, FDA Regulators have permitted the use of parabens in both cosmetics and foods despite admittedly lacking information necessary to be able to assess its long term toxicity respective to it’s potential carcinogenicity, estrogenicity or other yet to be discovered hazards . “TAHA International Inc. recalls Shakeel Bhai Mehandi Waley …” Government of Canada Recall & Safety Alerts, Government of Canada, 11 Apr. 2017, http://www.bing.com/cr?IG=FED3046DA7FB4BF5BB82F8CD8AFBAB57&CID=0C4FA5485AD76B491435AEDF5B786A5B&rd=1&h=IDkytGhC9nKbvfDpWOml3OHM7RbLCUzKnfmSY4YVPpc&v=1&r=http%3a%2f%2fhealthycanadians.gc.ca%2frecall-alert-rappel-avis%2fhc-sc%2f2017%2f62968r-eng.php&p=DevEx,5045.1. Neeraj, Verma, et al. “Retention of Color Intensity in Henna Paste During Storage.” Natural Product Radiance, vol. 7, no. 2, 2008, pp. 117–121. Underwood, Mitya. “Henna linked to leukaemia in women.” The National, The National, 9 May 2010, http://www.thenational.ae/uae/henna-linked-to-leukaemia-in-women-1.526815. Singh, Shweta. “Mehendi cones may carry harmful ingredients – Times of India.” The Times of India, City, 12 Aug. 2010, timesofindia.indiatimes.com/city/pune/Mehendi-cones-may-carry-harmful-ingredients/articleshow/6301746.cms. Mailonline, Sophie Inge For. “’I’m never touching hair dye again’: Woman claims she was an ‘hour from death’ after she developed BLOOD POISONING following a severe reaction to a home colouring kit.” Daily Mail Online, Associated Newspapers, 27 Mar. 2017, http://www.dailymail.co.uk/femail/article-4350280/Woman-just-hour-death-using-hair-dye.html. Chris Brooke for the Daily Mail. “Coroner attacks cosmetics firms after mother died of massive allergic reaction to her L’Oreal hair dye.” Daily Mail Online, Associated Newspapers, 20 Feb. 2015, http://www.dailymail.co.uk/news/article-2960349/Mother-died-henna-tattoo-holiday-Dubai-triggered-massive-allergic-reaction-L-Oreal-hair-dye.html. Routledge, Edwin J., et al. “Some Alkyl Hydroxy Benzoate Preservatives (Parabens) Are Estrogenic.” Toxicology and Applied Pharmacology, vol. 153, no. 1, 1998, pp. 12–19., doi:10.1006/taap.1998.8544. U.S. FDA. Parabens. http://www.fda.gov/Cosmetics/ProductandIngredientSafety (last update Oct 31, 2007). United States, Congress, “COMMISSION REGULATION (EU) No 1004/2014.” COMMISSION REGULATION (EU) No 1004/2014, Official Journal of the European Union, 2018. Okubo, T., et al. “ER-Dependent estrogenic activity of parabens assessed by proliferation of human breast cancer MCF-7 cells and expression of ERα and PR.” Food and Chemical Toxicology, vol. 39, no. 12, 2001, pp. 1225–1232., doi:10.1016/s0278-6915(01)00073-4. Darbre PD and Harvey PW. “Paraben esters: review of recent studies of endocrine toxicity, absorption, esterase and human exposure, and discussion of potential human health risks.” J Appl Toxicol.28, 5 (Jul 2008):561-78. Harvey, Philip W. “Parabens, oestrogenicity, underarm cosmetics and breast cancer: a perspective on a hypothesis.” Journal of Applied Toxicology, vol. 23, no. 5, 2003, pp. 285–288., doi:10.1002/jat.946. Center for Food Safety and Applied Nutrition. “Ingredients – Parabens in Cosmetics.” U S Food and Drug Administration Home Page, Center for Food Safety and Applied Nutrition, http://www.fda.gov/cosmetics/productsingredients/ingredients/ucm128042.htm. I must begin with the disclaimer: I am clearly stating–for the record–that this post is specific to the subject of white henna safety. It is in no way directed at any particular product, brand, artist, or anyone’s personal “white henna” formulation or work. The main image depicted at the top of this post is a random stock photo titled, “Caucasian pregnant woman with dreadlocks in boho style. White mehendi on big belly. Expectation of baby in new age lifestyle.” It is not a statement against the artist: I know neither the product used nor the artist who created the design. Never did I imagine I’d see anything henna featured on the pages of any major fashion or style publication let alone Vogue! Is henna art perhaps moving up in the world of fashion and culture from what haute couture considered its previous lowly position–the thing of drum beating hippies and bohos–to the heights of high end fashion? If so, it’s about time! Henna has been far underrated as an artform, a fashion, and means of self expression for far too long. Speaking of henna, The “white henna” phenomenon has also swept it’s way through the Natural Henna Community. The Natural Henna Community is a seemingly “everyone knows everyone” set of pocket communities that exist throughout the United States, Canada, Europe and worldwide, connected via various social media groups where artists share their latest designs, tips for perfecting natural henna paste recipes and exchange ideas. The Natural Henna Community has always maintained an all but fanatical orthodoxy for their exclusive use of all-natural and organic henna powders, their puritanical beliefs extending even to the ingredients added to the henna powder in order to form the paste that is eventually applied to the skin: adding only products entirely free of synthetic chemicals such as pure steam distilled essential oils that darken henna tattoo stain tones and raw cane sugars to bring about the perfect texture within henna paste. The growth of the natural henna community is likely a response to the increase in commercial factory-produced henna cones that seem to make it across Canadian and American borders en masse, despite having very questionable ingredients lists, or lacking FDA compliant labelling. The practice of adding solvents to commercially manufactured henna paste, specifically benzene, has led to a doubling in the risk of leukemia in Saudi Arabian women who regularly use commercially produced cones. The increase in the practice of addition of synthetic dyes such as the highly toxic coal-tar hair dye paraphenylenediamine (PPD) continues to become more common despite having been found to be the cause of numerous deaths, blood poisoning, skin burns and other serious health effects. The FDA considers benzene to be a chemical contaminant and PPD is prohibited for use in cosmetics that are applied to the skin, yet, it these products are very easy to obtain across Canada and the United States. Back to the White: I will admit, the stuff is absolutely gorgeous: its delicate feminine lacy appearance beautifies any bride adding a touch of elegance and beauty like nothing else. But Wait… there are no such things as white henna plants or white henna trees with white henna leaves… begging the question what is white henna? Hasn’t someone… somewhere along the way investigated this “white henna” and deemed it safe… who was that again… ? In essence, “white henna” is an entirely synthetic product developed by chemical companies and formulated from ingredients commonly found in pesticides, house paints, and science labs. Don’t believe it? Keep reading. So, how safe is white henna… really? It’s sold as “body paint,” “body art,” “skin art,” “temporary tattoo application,” I have even seen it called “Natural Herbal Quick Dry,” which is indeed a misnomer if there ever was one. This puts “white henna” into a whole other category of products entirely. It it’s not really a henna product at all, rather, it’s properly classified under the category of synthetic cosmetics. Let’s take a deep dive into this great white mystery and examine a few of the most commonly used ingredients found in many “white henna” formulations. For the purpose of brevity I will cover only one main ingredient group per post: some of the harmful effects of ingredients used are so extensive, that to identify and then parse out everything in one post would be daunting if not impossible to read let alone to write. I intend to continue to update with new posts as part of a White Henna blog series.